Until the very last second, I wasn’t sure if I would go. I had never been apart from either of them for even a day. Let alone a night. Or 5 nights in this case for this trip. Being away from them seemed so daunting. I knew they would be in good hands – my in-laws were excellent, involved and super-dedicated grandparents who wanted to spend some time with their grandchildren, especially since we all lived so far away. We lived as expats in Dubai, whereas they lived in Germany. Although we encouraged lots of visits to their grandparents (and to other set of grandparents too), I still hoped that the kids would be okay. I knew my 4 year old daughter who is super independent and outgoing would be fine, but I was more worried about my 18 month old son who was a total mama’s boy and cried whenever I left the room. Boy boy, did I need this child-free vacation! Lately our expat lives in Dubai had gotten beyond hectic. My husband was traveling more and for work and after his 4th business trip in 7 weeks, I found myself depleted to the core and struggling to manage the household, the kids, my writing commitments, and survive yet another week of solo-parenting in 45 degree Dubai heat, without going insane. From 5 am from the minute they woke till their heads hit the pillow at 7 pm, I was on call. When my daughter was in kindergarten, and my son took his midday nap, I used to sit down to write, trying to make the most of that 2 hour window. As soon as they were both in bed, it was time for me to start my other job and get busy writing. Living far away from home, family and friends and not having any regular help, meant that I was exhausted and might have caved in and probably would have been found under a huge pile of unwashed laundry by my neighbor one day. The only thought that kept me going all throughout most of May, June, and July was the promise of 5 days in Italy – just my husband and myself, while the kids stayed in Germany with their grandparents. 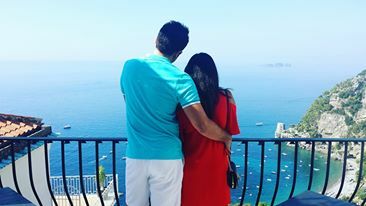 It was a big occasion for us – our 10th wedding anniversary, and somehow we both wanted to spend it by taking some time out for ourselves and reconnecting by doing what we both love and the thing that made us fall in love initially: travel! We first flew to Germany together as was our summer vacation plan. The plan was to spend a week together as a family and get the kids settled in and feeling comfortable. This happened in no time – soon the German countryside worked its magic on my kids and their days were filled with cherry picking, feeding the fishes, playing with the 2 cats and 1 dog at home, going for long walks in the open countryside, eating lots of ice-cream and splashing in their own private pool! Still my son remained attached to me and being so young I didn’t how to prepare him for what was to come. My in-laws comforted both my husband and I, told us not to worry and that both kids would be fine. They had planned plenty of fun things for them to do in the 5 days we were gone and trips to the Zoo and the Water park sounded like the kids would be thoroughly entertained. After a quick goodbye to our daughter (who had been fully briefed and was only too happy to stay at her grandparents), we were about to walk out of the door to catch our train to the airport when our son woke up and screamed the whole place down. My resolve faltered but my mother-in-law took 1 look at us and said “go, he’ll be fine, I promise he’ll calm down in a few minutes!” and by the time we were sitting in the car, I could hear his cries no longer. Thankfully he had settled down. We reached the train station, caught our train and I constantly felt on edge. Had I remembered to pack the diaper bag? Oh wait, we didn’t need that on this trip. At check-in at the airport, I asked if I could take the pram all the way till the gate, without realizing we had no pram with us this time. I absent-mindedly joined the “family/priority boarding” queue without realizing wait a minute, that wasn’t us this time. My mind was still on auto-pilot and my husband squeezed my hand and reminded me to relax. We had just checked up on the kids, they were both fine and the grandparents had assured us all was fine. About 5 hours after we left home, I finally started to feel myself to start to relax. I talked to my husband at length. Without any interruptions. We both looked at the books we’d chosen to take with us on the flight and teased each other since we would never read what the other had chosen. Waiting in queues suddenly didn’t seem so bad. There was no impatient child or whiny toddler to worry about. No nap times that had to be factored in and around flying times. A slight flight delay didn’t seem like the end of the world. When the car rental process in Naples took longer than expected (Italian efficiency at its best! ), I simply smiled – I didn’t have to worry about entertaining the kids and we were in no rush. We’d get to our hotel eventually. I didn’t have to worry about bedtime and getting the kids to sleep. Suddenly my mind felt free. This trip was a revelation of sorts. I realized that as a busy mom of two, I rarely allowed myself to relax. As soon as we walked into a restaurant, my eyes would be scanning the menu, asking the waiter to bring a high chair for my baby and simultaneously settling my daughter in with some coloring crayons and paper, to keep her busy. Now on our first ever child-free vacation since having kids, I suddenly found appreciating small luxuries such as finding myself with ample time to read the entire menu (from back to front!) and spending time deciding what to eat. Breakfast in the mornings at our hotel became a leisurely affair, with both of us ordering second coffees and just lingering on till we were ready to start our day. Most amazingly I realized that even after 10 years, countless dates and 2 kids later, the chance to spend some alone time with my husband felt so incredibly special. We talked and talked on this trip. About everything. About Italy and which town we liked best on the Amalfi Coast. About our life back home. About our marriage. About our family. About our goals and dreams. We made plans for the rest of the year. We discussed politics and debated world events and presidential candidates and I suddenly remembered the sheer pleasure of having unlimited time to talk to your partner about everything under the sun, without running behind for the school run or just rushing through the daily motions. Without starting 5 or 6 different conversations and not having the time to finish any of them. I realize now that I needed to spend some quality time with my husband with whom I started this adventure together. We needed time to reconnect as a couple, and feel supported and valued. When our relationship is strong, our children feel safe and secure too. Taking a child-free vacation was the best thing I could have done as a parent this summer. It allowed me the chance to reconnect to my pre-mom self by doing everything I loved to do: traveling, exploring new cultures, reading and spending time with my husband. It reminded me that I don’t need to feel guilty for spending time indulging in my passions and interests. Parenthood doesn’t mean forgetting who you are and replacing yourself with a new person. As I found out, keeping my “old self” alive was beneficial for me and my marriage and my kids. The break had benefited the kids too – my 4 year old daughter spoke so much German and had learnt so many new German words after being in a German speaking house and environment. My son too was now saying his first words in German: “Nein!” (no) to everything 🙂 The kids had bonded with their grandparents, the grandparents had enjoyed looking after them and appreciated how much hard work it is to constantly take care of two kids (my husband and I shared a knowing glance!) and all had gone exceedingly well. Like I said, it was the best thing I could’ve done this summer. Do you think taking a child-free holiday is selfish or sensible? Have you ever taken a child-free holiday yourself? Would you consider it? Hi Mariam, I was recently away for 8 days on a company trip and left behind my 8.5 months old and 25 months old boys with my husband. I cried the night before and the morning I left but it all turned out alright. It was refreshing to be away and get some time to myself and enjoy life without the duties as a mom. I’d do it again with my husband’s blessing or to go away with him if we can get someone to take care of the kids. Oh thats so lovely to hear Wani! So happy it all went well and you had some much needed time by yourself. I agree, that its so important. It can be hard, but so well worth it!